[Blog] Love Your Logs. It Pays Off. “My Artifactory won’t start”; “I see some lag”; “My artifacts are missing”; “I get issues when Jenkins tries to pull/deploy artifacts”; “I am getting 404 / 401/ 403/ 500 /409” … These are just a few of the common issues I hear from our customers. Very basic issues; right? We can triage them in a matter seconds… provided we have the right pieces of information. And indeed we do! All this information can be found in logs. This is why every developer and DevOps engineer should be in love with log files; this is love that really pays off. In this post, I’ll go through the extensive log information you have access to when using Artifactory. As developers and DevOps engineers, we all write applications and scripts to automate all the tedious, manual tasks we have to perform. It makes us more efficient and productive. As a best practice, we include a lot of debug information as part of our code and leverage it to quickly mitigate any issues that may arise. You can view any of these logs from within the Artifactory UI, or access them directly from your file system. But there’s more. Because Artifactory runs inside a tomcat container, you also have access to Catalina logs, and for next level debugging you can also activate traffic.log to monitor traffic and for auditing purposes. The verbosity of any logger in your system can be configured by entering or modifying the level value in the corresponding entry in the Logback configuration file, ARTIFACTORY_HOME/etc/logback.xml. In the rest of this post, I’ll show you how to make the best of Artifactory and related log files. The artifactory.log file is your main application log. It starts with the application and ends with the application. All the events that occur from startup to shutdown, as well as system error information can be found in this log. This is the key file to monitor when starting up Artifactory. Because Artifactory interacts with many components (database, storage [NFS / Object / DAS / NAS], load balancer, reverse proxy and in most cases network proxy) there are are many potential points of failure, and artifactory.log is the place to look if something goes wrong. Whether your Artifactory installation is an independent instance or a highly available cluster, this log file captures it all, and by analyzing it, you can mitigate 95% of all startup issues. Artifactory’s access.log is your go-to authentication log. It contains a full list of authentication requests providing important information about each one, whether accepted or denied. These include download requests, configuration changes, password resets, etc. Whether the request comes through the GUI, REST API or CLI, this log captures every aspect of the request – who, when and where – in an explicitly columnized structure so you can easily run a log parser against it to gain further insights. And in case you didn’t know, Sumo Logic is integrated with Artifactory out-of-the-box and is described in more detail below. Artifactory’s request.log can be considered to be a sibling of the Apache HTTPd request log. It is the place to monitor traffic, usage, requests and any other operation done within Artifactory. Like the other log files, this one is also columnized for easy analysis by log parsers. As the name suggests, Artifactory’s import.export.log is the log that captures all events and activities related to the import and export of the system. Import and export can be scheduled, and any issues occurring for this can be mitigated by analyzing this log file. As mentioned before, Artifactory comes with Sumo Logic integrated out-of-the-box. To connect with Sumo Logic, all you need to do is fill out the relevant fields in the Artifactory UI. If you don’t already have an account with Sumo Logic, Artifactory will automatically create one for you and start sending log data for analysis. The Sumo Logic data analytics platform will, in turn, display pre-enabled dashboards which can be customized as needed. 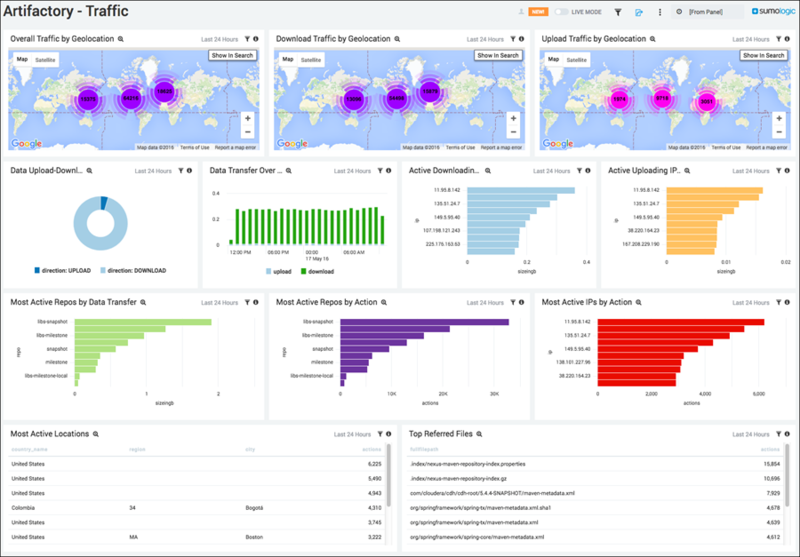 This enables you to access Sumo Logic’s premium operational analytics directly from Artifactory, letting you index and analyze both structured metrics data and unstructured log data together in real time. You can then have a variety of dashboards such as Traffic by geo-location, Active IPs, Most active repositories, Top referred files, Requests by status codes, Denied login attempts and much more. You need to edit the $ARTIFACTORY_HOME/etc/logback.xml file to send logs to the Syslog facility by adding an appender to Syslog. Add the appender to the output. Make sure to save the logback.xml file and note that you don’t even have to restart Artifactory for this change to take effect. So there you have it. Artifactory offers tons of information in its different log files. All you need to do is open them – whether from within the application UI or in any text editor. From identifying critical errors to tracking different types of traffic to your Artifactory servers, log files are an extremely useful resource. If you love your log files and handle them correctly, they will love you right back and give you all the insights that you need.